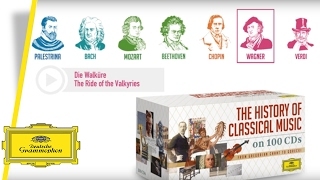 "If not for mine"/"Pursue thy conquest, Love"
"Ruinnd ere"/"ho, ho, ho"/"but ere..."/"In our deep..."
CD 21: Haydn: Symphonies No.45 "Farewell", No.88 & No.104 "London"
CD 22: Haydn: String Quartets No.63 In D, Op.64 No.5 "The Lark"; No.74 In G Minor, Op.74 No.3 "The Horseman"; No.77 In C, Op.76 No.3 "Emperor"
CD 29: Beethoven: Symphonies No.5 In C Minor, Op.67 & No.6 In F, Op.68 "Pastorale"
CD 30: Beethoven: Symphony No.9 In D Minor, Op.125 "Choral"
CD 32: Beethoven: Sonata For Violin And Piano No.9 In A, Op.47 "Kreutzer"; String Quartet No.7 In F, Op.59 No.1 "Rasumovsky"
CD 36: Schubert: Symphony No.8 "Unfinished"; Symphony No.9 "The Great"
CD 37: Schubert: Piano Quintet In A, D.667 "The Trout"; String Quartet No.14 In D Minor, D.810 "Death And The Maiden"
CD 47: Schumann: Symphony No.2 Op.61; Symphony No.3 Op.97 "Rhenish"
CD 53: Brahms: Violin Concerto In D, Op.77; Sonata For Piano And Violin No.1 In G, Op.78 "Regenlied-Sonate"
CD 56: Smetana: The Moldau, From Bohemia's Meadows And Woods / Dvorák: Symphony No.9, Op.95 "From The New World"
"Fliegt heim, ihr Raben!" / "Zurück vom Ring!" CD 78: Puccini: Tosca - Highlights; "Nessun dorma"
CD 80: Rachmaninov: Piano Concerto No.3 In D Minor, Op.30 / Scriabin: Symphony No.4 Op.54 "Le Poeme De L'Extase"
Symphony No.4 Opus 54 "Le Poeme De L Extase"
Piano Sonata No.2 "Concord, Mass., 1840-1860"
CD 95: Gershwin: Rhapsody In Blue; An American In Paris / Bernstein: "Candide" Overture; Symphonic Dances From "West Side Story"
CD 99: Gorecki: Symphony No. 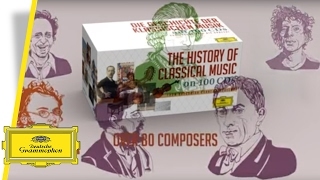 3 "Symphony Of Sorrowful Songs"
Watch the animation for the limited edition box set "The History of Classical Music" - Deutsche Grammophon's authoritative guide to the Classical Music world.